To locate a Design Platform horizontally within a model. To set the platform at a desired design height. To apply batter slopes from the edge of the platform to the model. 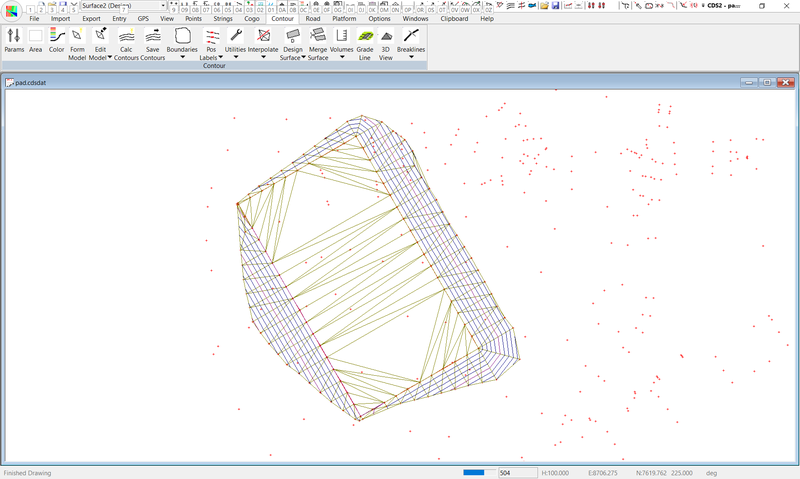 To calculate the volume on material to be moved to construct the platform. To adjust the design height of the platform to balance the earthworks. Base data has been supplied in a Job with an ID of "PAD" Start CDS and use File Open to open "pad.cdsdat" located in the Foresoft\cds2\tutor folder. The screen should appear as seen below. The client requires us to position a level pad with dimensions 180 metres by 100 metres to use for standing a dragline, and the earthworks should be close to balanced with a small excess of cut being preferable. In this instance we have examined an existing contour plan of the site, and in the time honoured method of design we have pencilled in a rough area where we would like to place a pad, and scaled off one of the corners.The bottom left hand corner of the pad should have coordinates of East 8690 and North 7540 and the long side of the pad is on a bearing of 330 degrees. As a preliminary estimate, we think that a finished level of the pad of 225 might be somewhere near the mark. and beyond the scope of these tutorials to deal with ... all that is important is that you locate it somewhere. Our first task is to calculate the points on the corners of our proposed pad, and give them our trial RL of 225. Use the Modes Icon (or F9) to pull down the Modes Screen.Now select the Tab titled Modes-Input, and the screen at right should appear. Move the cursor down to the line "Prompt for Design Height", and select the radio button titled Constant. Now enter a constant value of 225. Pull down the Points menu and select Add Points - you will notice that your cursor changes to a cross. Position it somewhere on the model and select a point. When the Add/Edit/Query box appears, enter a Point Number of 500, and Easting of 8690, Northing of 7540 and a Design Height of 225. Select OK, and Point 500 will appear on the screen. Enter 500 as the point to start from followed by 330 for the bearing and 180 for the distance. Select Apply and you will see point 501 appear.To get the next point, position the cursor in the “bearing” field and press the ‘R’ key to add 90 degrees to the current bearing. Tab to the Distance filed and enter 100, then select Apply to create Point 502. Again move to the bearing field, press ‘R’ and then enter the distance of 180 and Apply to create point 503, which is the final corner of our pad. It is a requirement that the pads are defined in a String Folder with a name of "PAD". Type in ‘pad’ for the folder name. Note that it doesn’t matter whether you try and use upper case or lower case, the program will convert everything to lower case as you enter the Folder name. This is necessary to avoid some slight confusion between file or folder naming conventions in different version of Windows. Use an ID of P1 and accept the default pen and linetype. Move the cursor into the string entry field, and either type in the string 500,501,502,503,500, or use your mouse to select the points. At the end of the process your screen should be similar to the one shown above. Once you have finished adding in the string to define the pad, click on the "Platform Menu" and then the option titled Create Design Platforms. The screen will appear as seen at right. The first field is Next Point, and here I suggest you use point number 600. It is always a good idea to put different ‘groups’ of points in readily identifiable number ranges for future reference, it makes it easy to select these pad points if you know that all the design points are numbered between 600 and 700 for example. The next field is Distance between Points, and I suggest a value of 10 is suitable. 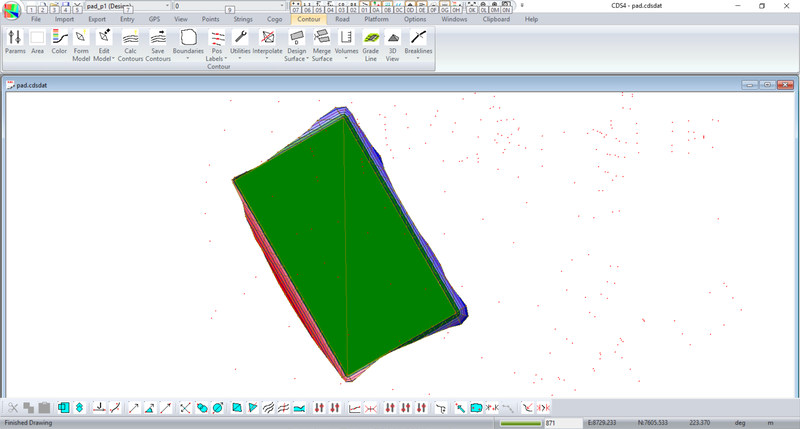 If you leave this distance at 0, the program will only calculate points opposite each of the corners, and you will learn to vary this distance depending on the shape of the pad and the nature of the underlying surface.Next fill in both Cut and Fill batters with “1:2” to indicate that you want a 1 in 2 or 2 to 1 or 50% batter slope to be applied. Once you select OK, the calculation will take place and the screen will be redrawn showing the newly calculated points, and the string or strings defining the toes or tops of the batters. 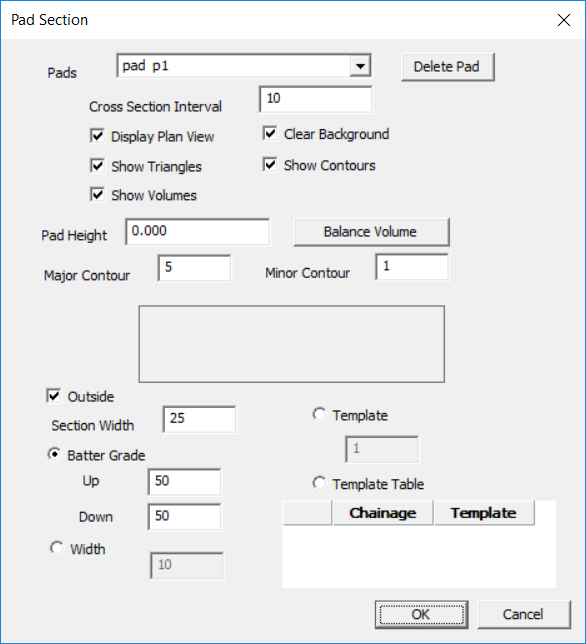 Now pull down the Contour menu, and select Surface parameters. Select the button on the right hand side titled Add, and the screen will appear as below. Select the radio button titled Design to indicate that it is a design surface which we wish to add and then select OK.Now select the Reset button towards the bottom right of the Surface parameters screen to tell the program to scan the database and find all the Design points in the current job. You should note that the Minimum RL displays 216 and the Maximum RL displays 232. Select OK on the parameters screen to save the changes. Now pull down the Contour Menu and Form the Model. Next Calculate the Contours and if you let them save, you should end up with a display as shown at right. If you do not have contours resembling those in the screen then you need to go back and re-trace your steps until you do. volume of earth to be moved to construct this pad. 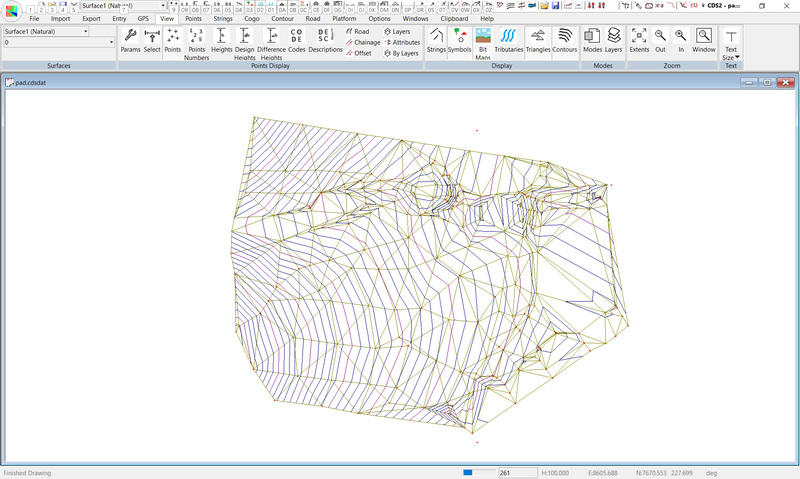 Pull down the Contour Menu, select Volumes, and the select Surface to Surface.The Base Surface is Surface 1 which is the natural Surface, and you will need to change the Overlay surface to be Surface 2 which is your design surface at the moment. The screen should appear as seen at left. 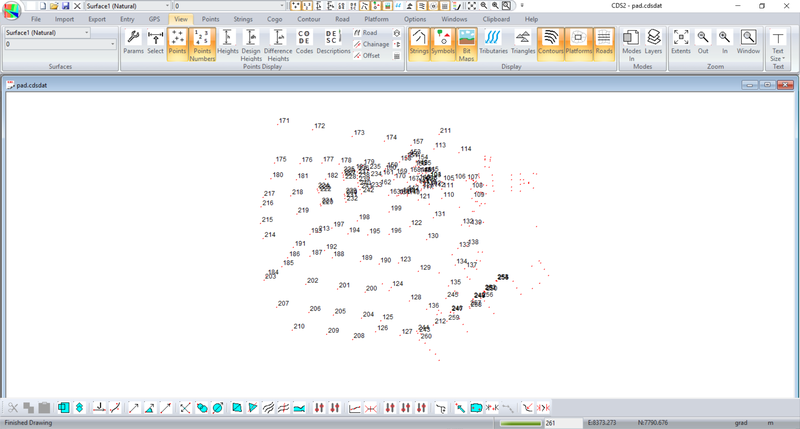 Once you have the surfaces correctly assigned, press the OK button, and you will soon see the answer appear in Wordpad which reveals some 50,000 metres of fill and 13,000 metres of cut. It is obvious that we have far too much fill in this instance, so we need to drop the proposed level of the pad. The first thing you need to do is to delete the points that were calculated for the first attempt at the pad since they are no longer useful. So, pull down the Points menu and pick the Select option. Then choose Select by Range. The following screen will appear, and the easiest way to achieve the range you need is to select the All button on the Point Number line, then alter the start of the range to be 600. Whichever way you elect to so it, you need to have the screen exactly as seen at right before you select OK.
You will see all the selected points appear in dark numbers. All the selected points will now be deleted from the screen. Note that there is no longer a question asking if you are sure, because we have built in an OOPS function which will allow you to recover deleted points but only if you do it before you exit from the job. You should also note that even though the design points are gone from the job, the design contours will still be displayed until you form them again. Now, in an attempt to balance the cut and fills for this job we have already established that we need to drop the pad, and using the time honoured method of educated guesswork, I suggest that you drop it by 1.5 metres and see what eventuates. To achieve this, again pull down the Points menu, and Select by Range. This time the range you require is 500~503. Once these points are selected, again pull down Points menu, and choose Alter. When the screen appears, enter a value of -1.5 in the Design Height Field and select OK.
Now, before you go back to create the design platform, you should know that it will only work if you are currently logged onto the natural surface you wish to work with. 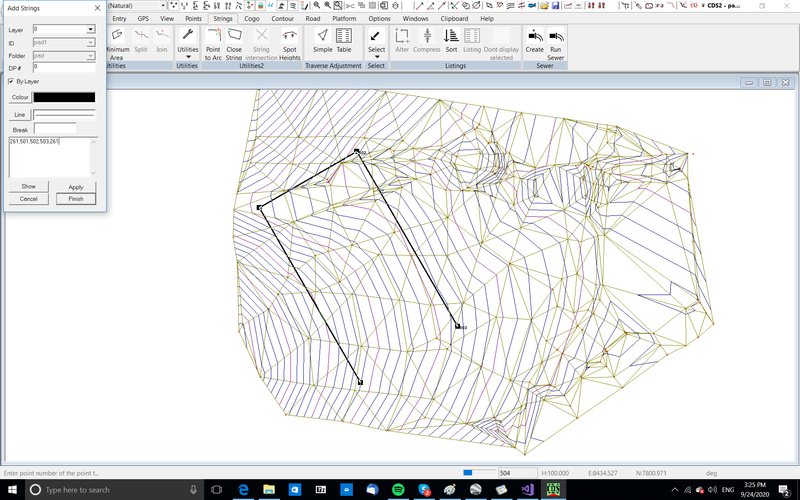 So, pull down Contour, choose Surface Parameters, and make sure that Surface 1 is current by pulling down the arrow and selecting it. And, before you ask, no, the computer can’t do it automatically, because we have now given you the ability to have multiple surfaces in a given job, and there is no way of the program knowing which one you wish to work with. Once you have set the surface correctly, pull down the Contour menu, choose Design Surfaces, and pick Create Design Platforms again. Again use a Next Point of 600, Distance of 10 and batters of 1:2. 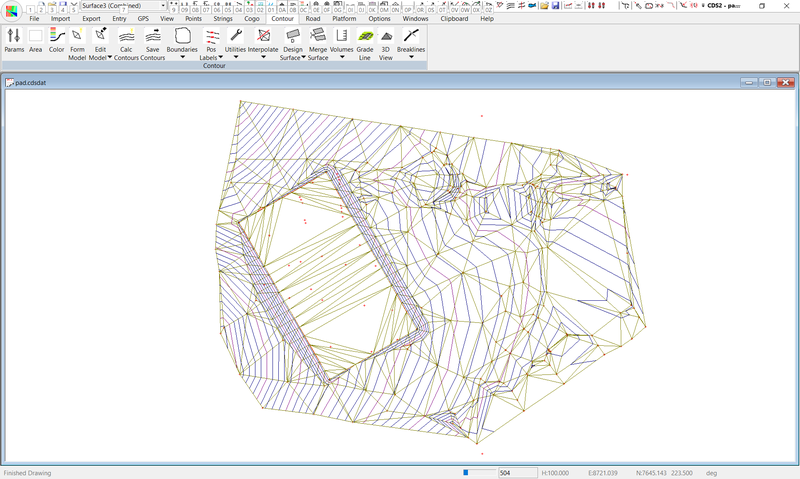 Once the points are calculated and stored, pull down Contour, select Surface Parameters and make Surface 2 current. Now Form the Model and calculate and save the contours..
Once that is done, it is time to again calculate a volume and see how close to balance we have come. 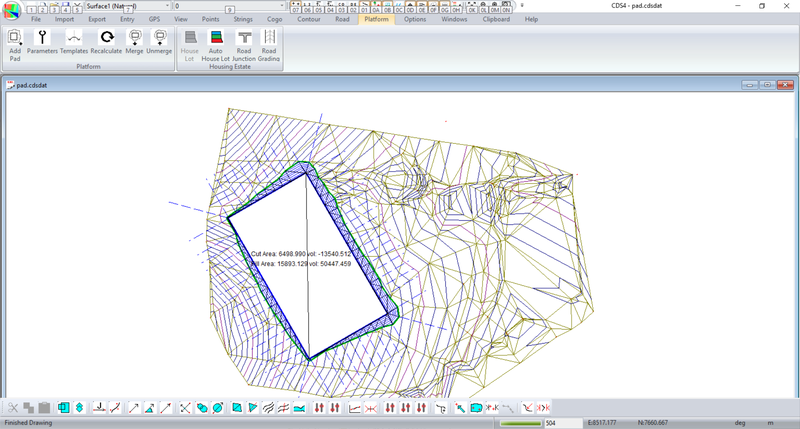 Pull down Contour, choose Volumes and Surface to Surface, and make sure that the Overlay Surface is set to Surface 2. The answer you get should be as seen in the screen below, which for the purposes of the exercise is close enough. 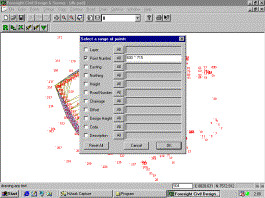 You should now be aware of the procedure which is more important than the numbers we use in any of these examples.Before we proceed, you need to be aware that the program has stored the string around the outside of the design surface in a String Folder named “padb”, and you can use this for plotting etc. The next thing we wish to do is to form up a Combined Surface which will show us the contours after the pad has been built ( An “As-Built” , or “As-Constructed” if you like). 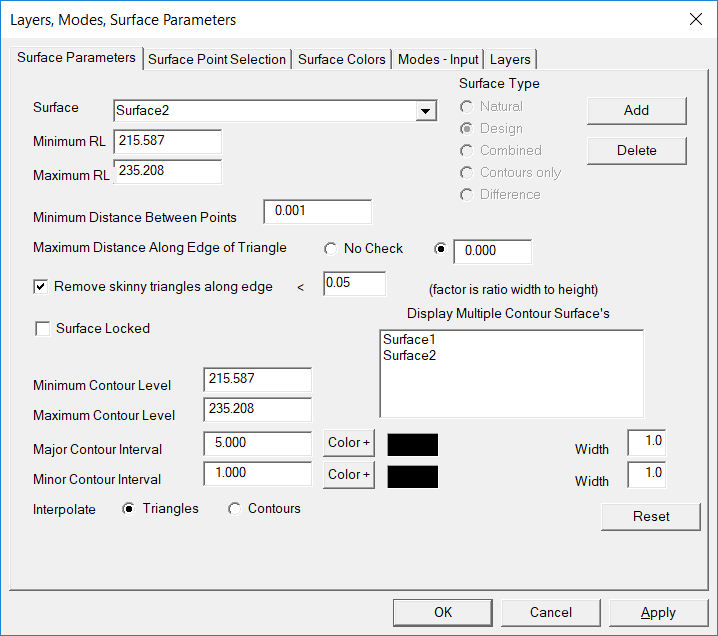 Pull down Contour, choose Surface Parameters and choose Add to create Surface 3, and make it a Combined Surface. Make sure Surface 3 is current and press OK.
Now pull down the Contour Menu and choose Merge Surfaces. 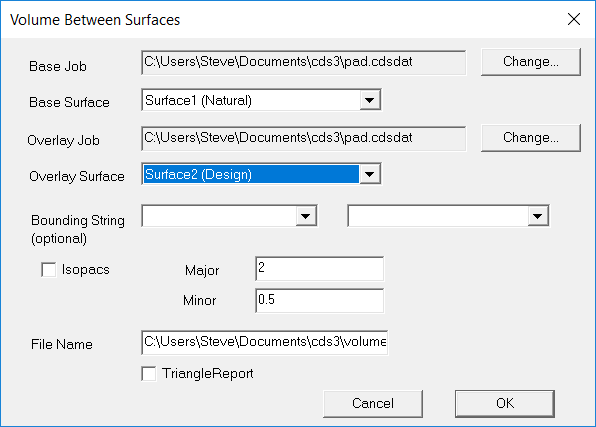 Accept the default Base Surface of Surface 1, Overlay surface of Surface 2 and Merged Surface of Surface 3. choose Design Surface, and select the option titled “Design Platform Combined Surface”. You will see that the program goes off and automatically forms the combined model for you. If you now Calculate the Contours you should achieve a result as seen below. Note we have only used one platform in this example, but you can define more than one in the “pad” folder if you wish. You should also note that you could have achieved this same result using the option Design Platform with Templates. Under that scenario, you would need to create a Template to use around the platform. You could then have used the height correction facility contained in Design Platform with Template to run and re-run the routine with various corrections to the design platform height to obtain the balance of cut and fill.